Emily Kame Kngwarreye is one of the most prominent and successful artists in the history of contemporary Australian Indigenous art. Born c. 1910, Kngwarreye took up painting late in life. She lived at Alhalkere in Utopia, 250 km north east of Alice Springs in desert country. Emily passed away in 1996. Her sister, Weata Kngwarreye (c.1910-c.1998) was also an artist and their brother, Kubbitji Kngwarreye (born c. 1928) is a well-known artist painting abstract colour representations of country in an expressionist style reminiscent of Emily’s later works. In 1992 Emily was awarded the Australian Artists Creative Fellowship by Prime Minister Paul Keating. 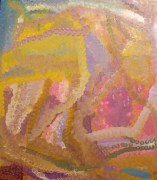 In 1998 a retrospective of her paintings was held at the Queensland Art Gallery, curated by Margo Neale. The retrospective exhibition travelled to the Art Gallery of New South Wales and the National Gallery of Victoria. Kngwarreye\'s work represented Australia in the 1997 Venice Biennale. A major retrospective of Emily’s art- Utopia: The Genius of Emily Kame Kngwarreye was toured to the National Museum of Art, Osaka and the National Art Centre, Tokyo before going on exhibition at the National Museum of Australia, Canberra in 2008.